Kids need a place to rest, play, study and have some privacy. A child's only get-away is his bedroom. Unfortunately, most kids' bedrooms are way too small. There's no room for a study desk, to play, or to visit with friends. Our Kids Bedroom Organizer (which is a complete bedroom suite in one compact product) can literally change your child's room. It will create the extra floor space needed for a desk, and a place to play getting rid of wall dressers. It will also provide additional drawer storage by replacing the space wasting box spring and steel bed frame with a 3,6, or 9 drawer underbed dresser, making your child's room much easier to keep clean, neat, and organized. Dust-proofed. Solid wood exterior. Back side beautiful wood veneer. Precision drawer slides. Tongue and groove construction. 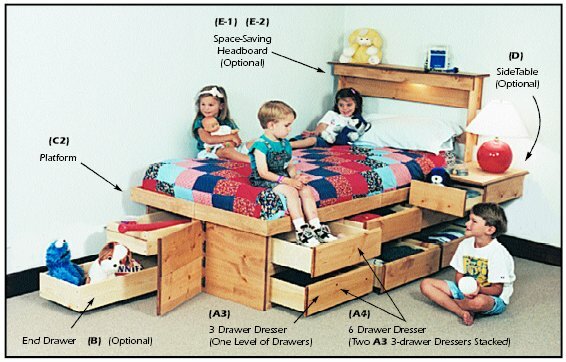 Use your own mattress and headboard, or create your own unique bed by ordering any of the "optional" components you want, such as end drawers (B), platform (C), side tables (D), or headboard (E). Bed is finished on both sides, and can be located in the center of a wall or any corner. Drawers are on one side only, but can be setup to open from either side. See Finish. Unassembled. Made in USA.